Melissa proves that healthy eating at home is easy, achievable, and affordable. Order your copy of Melissa’s new cookbook now! 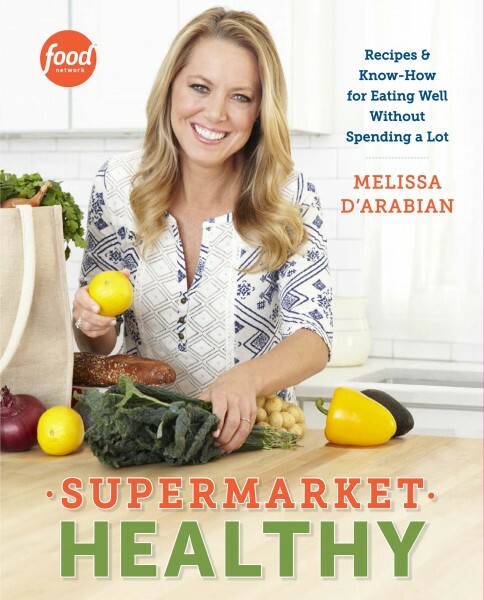 In her highly anticipated second cookbook, Food Network personality and New York Times bestselling author Melissa d’Arabian proves healthy eating can be easy, affordable, and achievable with ingredients from the neighborhood grocery store. In SUPERMARKET HEALTHY: Recipes and Know-How for Eating Well Without Spending a Lot (Clarkson Potter/Publishers; on sale December 30, 2014; $24.99; Trade paperback), Melissa—a trusted resource on healthy and affordable family home cooking—busts the myth that healthy home cooking requires trips to specialty stores for fancy and high-priced ingredients. Supermarket Healthy celebrates dishes that are as friendly to your waistline as they are to your wallet. Publishing just in time for the most popular New Year’s resolutions to eat better and save money, Supermarket Healthy is the ultimate toolkit for every home cook who wants to do both, without sacrificing flavor or variety. In today’s health-conscious world, everyone wants to feel good about what they are eating and what they are feeding their families; in Supermarket Healthy, Melissa shares more than 130 family-friendly (yet company-worthy!) recipes—each including nutritional information—to show readers how to spend with purpose, cook with love, and savor healthy, homemade meals. In addition to the recipes, Melissa features her color-coded top tips for shopping, cooking, and entertaining as well as healthy Blueprints—easy-to-follow skeleton strategies for recipes such as trail mix, frittata, salad-in-a-jar, meatballs, skillet-glazed vegetables, and slow-cooker meals—perfect for mixing and matching ingredients to create endless options in the kitchen. Rooted in the way she cooks and eats at home, Melissa created Supermarket Healthy from a health-conscious perspective and with a focus on recipes that feature ample protein, healthy fats, slow-burning complex carbohydrates, and plenty of vitamins and nutrients. Whether looking for healthier takes on indulgent classics, ethnically diverse dishes spanning countless cuisines, unexpected ways to use everyday ingredients, or new ideas to shake up your weekly mealtime menus, this cookbook celebrates dishes that are as friendly to your waistline as they are to your wallet. See 4 recipes (plus a Blueprint recipe), read Melissa’s introduction to the book, and view the table of contents in this first excerpt from Supermarket Healthy. Published by Clarkson Potter/Publishers, an imprint of the Crown Publishing Group, a division of Random House, Inc., New York.